As used by leading motor caravan manufacturers. All lining carpets are 2 Metres wide and are sold per linear Metre. Samples are available on request. Please note: Shades may vary slightly from batch therefore please ensure you order enough material to complete the job. Ideal for use in vehicle trimming applications such as headlinings, door and panel trims, carpets etc. It exhibits high temperature resistance up to 70°C (160°F) and is extremely flexible. Trimfix is suited for bonding most furnishing materials including fabrics, leather, foam, carpets etc to themselves or each other or to substrates such as wood, metal, glass or rubber. Forms a strong, permanent contact bond between the following materials: Supported PVC leather cloth, leather, polyester glass fibre, rubber sheet and extrusions all of which may be bonded to each other or to hardboard, chipboard, wood, painted or unpainted metal. 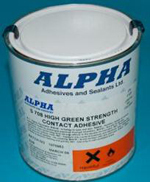 Rigid laminated plastics such as Formica, warerite, melamite etc may also be fixed with this adhesive.